On 9 April 2019, a JSDF F-35A attached to Misawa Air Base disappeared from radar during a training mission over the Pacific Ocean, when it was about 84 miles (135 km) east of the Aomori Prefecture. The aircraft was confirmed to have crashed after debris from it was found on the water. The fate of the pilot is still unknown. The pilot, 41-year old Maj. Akinori Hosom, was on a routine air combat training mission with three other F-35s. The Major radioed the other three pilot that he was aborting the drill shortly before disappearing. Both the US an Japanese Navy have sent ships and aircraft to search for the missing jet and pilot. In response to the incident Japan has grounded the remaining 12 F-35As but is still committed to purchasing 105 F-35As and 42 F-35Bs. There has been speculation that China or Russia might attempt to salvage the crash jet, but Defense Minister Takeshi Iwaya has stated there has been no reported activities from either countries. The cause of the crash and its disappearance from radar has baffled investigators as the jet is outfitted with a transponder that will reveal its location on radar. It is reported that the jet did not send a distress signal during the crash nor the pilot mentioned any problems with the aircraft during communication. In addition, the training was not a low-level flight, suggesting that Maj. Akinori Hosom could have had time to react given his wealth of experience. ^ Kubovich, Yaniv (2018-05-22). "Israel Launched World's First Air Strike Using F-35 Stealth Fighters, Air Force Chief Says". Haaretz. Retrieved 2018-05-22. ^ Barrett, Paul (April 10, 2017). "Danger Zone". Bloomberg Businessweek. pp. 50–55. .
^ a b "Capabilities". lockheedmartin.com. Lockheed Martin. Archived from the original on July 24, 2010. ^ Tucker, Patrick (January 8, 2015). "The F-35 Has To Phone Texas Before Taking Off". defenseone.com. Defense One. Retrieved 2 July 2015. ^ Clark, Colin (6 June 2014). "Gen. Mike Hostage On The F-35; No Growlers Needed When War Starts". Breaking Defense. Retrieved April 5, 2019. ^ Davenport, Christian. "Meet the most fascinating part of the F-35: The $400,000 helmet". WashingtonPost.com. Retrieved August 2, 2015. ^ "F-35C Completes First Night Flight Aboard Aircraft Carrier". US Navy. 13 November 2014. Retrieved 2014-11-28. 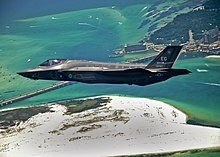 ^ "Air Force issues flight release for Eglin AFB F-35A". af.mil. US Air Force. 28 February 2012. Archived from the original on August 2, 2013. Retrieved 5 May 2012. ^ Editorial, Reuters. "Singapore 'seriously evaluating' future F-35 jet purchase -..." U.S. Retrieved 2018-06-28. ^ hermesauto (2018-06-30). "Decision on F-16 fighter jet replacement likely in next few months: Ng Eng Hen". The Straits Times. Retrieved 2018-06-30. ^ "F-35 project to 'earn Turkey $12 billion'". Hurriyetdailynews.com. Image credit: Reuters. Reuters. 13 September 2011. Archived from the original on 25 May 2014. Retrieved 30 May 2013. 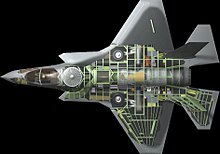 ^ "UK Confirms First F-35 Orders". DefenseNews. 24 Nov 2014. Archived from the original on 26 November 2014. Retrieved 2014-11-28. ^ "Singapore identifies F-35 fighter jet to replace F-16s, expects to buy 'small number' for full testing". Channel NewsAsia. Retrieved 2019-01-18. 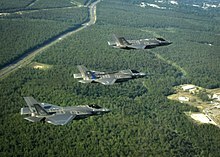 ^ "F-35A Lightning II declared combat ready by Air Force". Military Embedded Systems. 2016-08-02. ^ "Air Force Declares F-35A Ready for Combat". Defense News. 2016-08-02. ^ "Military Aircraft:Written question – 60456". UK Parliament. Retrieved 2017-07-04. ^ Cameron, Doug (5 February 2014). "Navy F-35 Set For Sea Trials After Tailhook Redesign: Lockheed Says Naval Version On Schedule". The Wall Street Journal. New York: News Corp. ISSN 0099-9660. OCLC 781541372. Retrieved 24 May 2014. (Subscription required (help)). ^ a b Ahronheim, Anna (November 26, 2018). "Air Force Bolsters Stealth Power as More F-35I Fighter Jets Land in Israel". Jerusalem Post – via jpost.com. ^ Diplomat, Franz-Stefan Gady, The. "Japan to Procure 25 More F-35A Stealth Fighters". The Diplomat. Retrieved 2018-03-30. 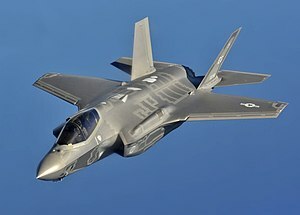 ^ "F-35 teslimat töreni başladı". kokpit.aero (in Turkish). 2018-06-21. Archived from the original on 2018-06-21. Retrieved 2018-06-21. 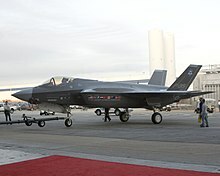 ^ "Luke AFB stands up new F-35A lightning II fighter squadron". Airman 1st Class Aspen Reid. Retrieved 7 Dec 2018. ^ "TCG Trakya, On The Way". en.c4defence.com. 2018-05-22. Archived from the original on 2018-05-22. Retrieved 2018-05-22. ^ Sonne, Paul (2018-09-28). "F-35 crashes for the first time in the jet's 17-year history, pilot ejects safely". The Washington Post. Retrieved 2018-12-08. ^ "F-35B Short Takeoff/Vertical Landing Variant". lockheedmartin.com. Lockheed Martin. Archived from the original on March 17, 2011. Retrieved 13 July 2012. ^ "F-35C Carrier Variant". lockheedmartin.com. Lockheed Martin. Archived from the original on March 17, 2011. Retrieved 13 July 2012. ^ North, Gary (April 2016). "Long Combat Radius" (PDF). F-35: The Future is Now. Retrieved April 5, 2019 – via fisher.org.il.